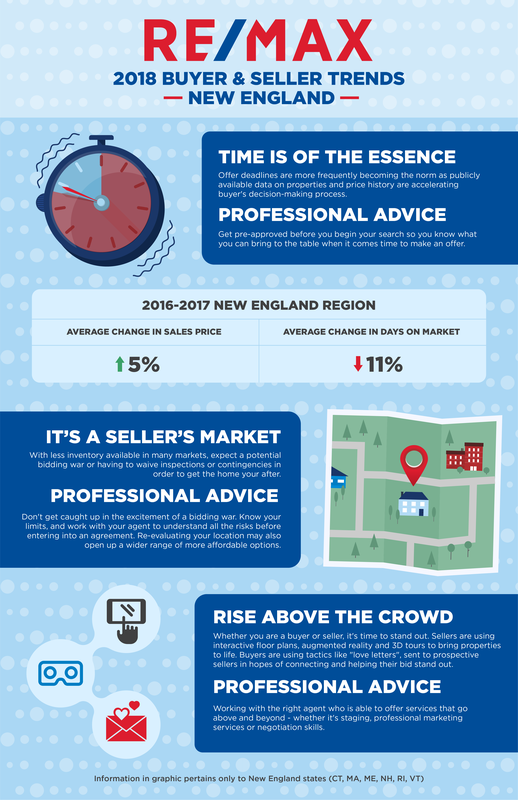 Home/Marketing, Resources, Social Media/2018 Buyer & Seller Trends in New England: Infographics To Share! 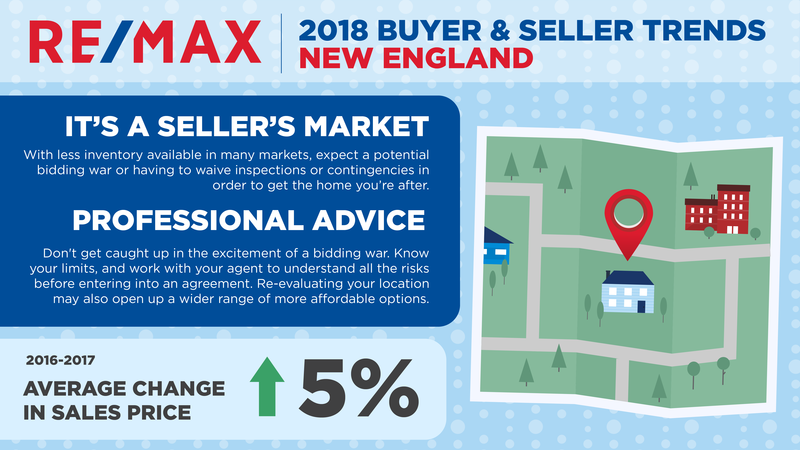 With clients looking to buy or sell their homes this year, we know that as RE/MAX Agents or Broker/Owners you have what it takes to help them get well on their way to their dream home in 2018. Below we’ve compiled 2018 buyer and seller trends and practical advice you should keep your eye on to help you succeed and meet your goals this year. We’ve also put it all on infographics for you to use and share! From 2016 to 2017 in the New England area alone, the average sales price of a home has gone up 5% and the average number of days on the market has dropped 11%. What does this mean? 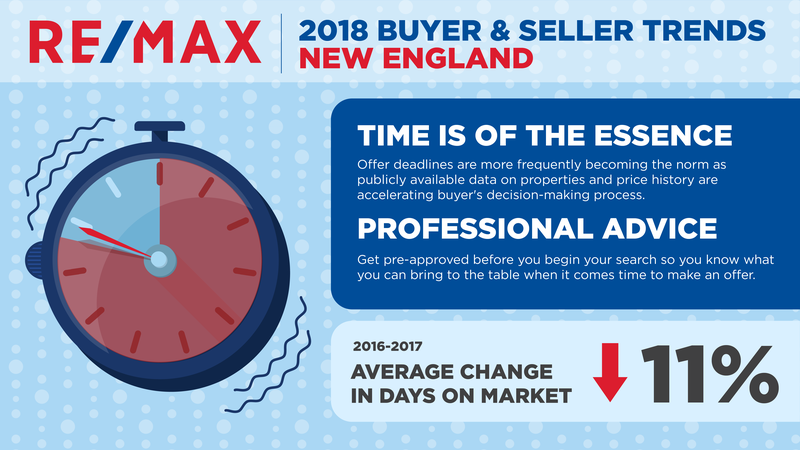 Offer deadlines are more frequently becoming the norm as publicly available data on properties and price history are accelerating buyers’ decision-making process, pushing sellers to capitalize on this trend. Our advice: get pre-approved before looking- it will allow you to compete better! With less inventory available in many markets, expect a potential bidding war or having to waive inspections or contingencies in order to get the home you’re after. Our advice: understand all the risks before signing and be open to a wider range of options. It’s time to stand out, whether you’re trying to buy or sell. Sellers are using interactive floor plans, augmented reality and 3D tours to bring properties to life. Buyers are even sending “love letters” to prospective sellers, in hopes of connecting and helping their bid stand out. Our advice: work with your agent to get creative with your offer or to bring your property to life. Now, get creative and download these infographics below to share on social media!